Earlier this year and for the third year in a row, Nokia Networks was named as a leader in Gartner’s “Magic Quadrant for LTE Network Infrastructure”. Now it’s our small cells portfolio's turn, which has just been placed in the leaders’ quadrant in Gartner’s “Magic Quadrant for Small Cell Equipment 2014”. We believe this placement is the result of our strategy when building a small cells portfolio that is focused on being the best in the market. One of our guiding principles is to always put the needs of mobile broadband operators at the forefront of our small cells roadmap planning. That’s why we created Liquid Applications, which resides in the base station to provide ultra-low latency and high throughput as well as direct access to real-time radio network information, enabling operators to offer added value services to their subscribers. And it’s why we recently further enhanced our Nokia Services for HetNets with a new cluster-based solution for small cell delivery that reduces deployment time, as well as planning and optimization capabilities built on 3-D geolocation. Operators can now understand indoor traffic requirements floor-by-floor and thus provide more efficient indoor small cell deployments. 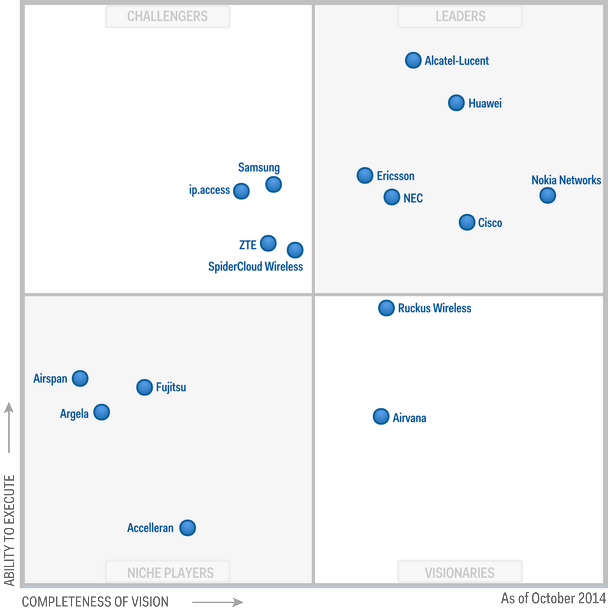 Making it into the leaders’ quadrant is something we are proud of. More importantly we believe it shows that we have listened to operators and what they tell us are their priorities. With this insight, we’ve been able to implement the solutions they need. Keeping in front of the pack is nice, but it really means that, when it comes to small cells, we can help keep our customers ahead of the game. The Gartner “Magic Quadrant for Small Cell Equipment” is available here. Share your thoughts on this topic by replying below – or join the Twitter discussion with @nokianetworks using #NetworksPerform #mobilebroadband #smallcells #LTE #HetNet #Nokia.